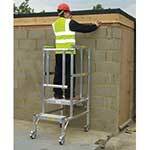 Portable work platforms are a simple, effective solution for carrying out low level work tasks. 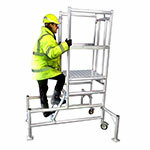 With their scaffolding style construction, podium steps provide a secure safety platform for working at heights, their tubular construction provides all round protection. 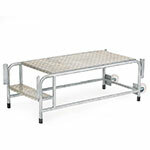 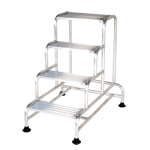 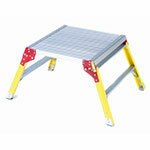 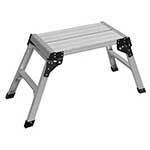 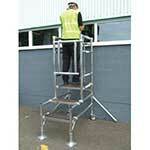 Our standard non-slip work platforms are sturdy, easily stored away and can deal with loads up to 150kg. 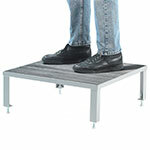 Alternatively, our podiums are idea for quick jobs around site, these podiums fold away neatly between jobs and can carry a load of 150kg. 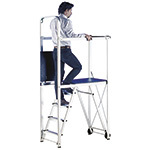 Available in two heights this podium is still compliant with working at height legislation.